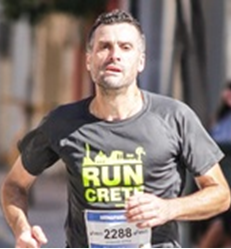 Returning after 5 years of absence from sports, I chose to run the Crete Half Marathon as a test for the Classic Marathon. Why, however, the Crete Half Marathon? Come to run next year and you will understand! I ran, danced, ate, drank mild isotonics and raki, I laughed, I cried (out of joy) and generally I enjoyed myself! We athletes need such races to gain strength and keep going! The route was wonderful, we passed through picturesque villages where people of all ages waited for us to applaud us and encourage us. They did it above and beyond! A big thumbs up for those who labored to achieve this result. 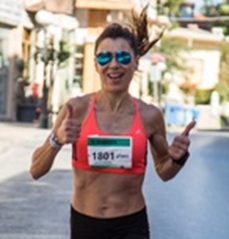 For me, it was the first time I run at this distance and for that very reason I chose to compete in the 2nd Crete Half Marathon, in my homeland!! It was a flawless and professional event that even reached the levels of the Authentic Marathon of Athens! ​It seemed that both the organizers and the volunteers really love running, putting in a lot of positive energy, while taking care of the smallest detail. It was a celebration of mass sport and I am very glad to have participated. I would be honored and glad to come back in 2017. Congratulations on the effort everyone!! A great SPORTS FESTIVAL and especially a "Cretan sports feast" is what we enjoyed, all of us who participated on Sunday, October 2, at Arkalochori. Perfect organization in all respects... electronic timing, willing volunteers everywhere, water bottles, bananas… cretan buffet, music, dancing, perfect abundant amphitheater space with dressing rooms... showers, toilets and hundreds of people. And the best thing, great guest stars... Olympic athletes!!! The medals were little shoes... the ax… and the big shoe for the winner was also unique!!!! Thank you very much to all those who helped make this idea come true in the best way! I wish your participations to be more and more every year!!! First of all, I want to congratulate and thank the organizers and volunteers for the impeccable hospitality and service... I felt that I was running in my house. I had no idea about the race. "Let's go there too," I said. The truth is that the inspirational videos that circulated for the advertisement of the race have triggered my curiosity. But I did not expect in any case what would follow. Arriving at Arkalochori, one can see the first volunteers giving directions on how to get started. And after a while, we reach the exhibition center. We enter the theater. From the first steps I realized that this is different. It's the first time I've ever felt the atmosphere I've always expected to feel in a mass race. And I've gone to several. The atmosphere there is when the service of this supreme ideal called mass sport is an end in itself. The liveliness and the positive mood of a crowd who is eager not to compete, but to be present at a great celebration of sport, at a great celebration of life! A crowd, who wants to run, laugh and enjoy life! That should also be the purpose of any mass race. And at the finish line, a work of art as a medal! I hope that the case of the Crete Half Marathon will be an example for the other events of the island as well as those of the whole country! I think every runner has to experience this unique atmosphere. The excellent organization, the amazing service of the volunteers, the climate... Many congratulations. The Crete Half Marathon was proof for me that a good thing may come slow, but it will always stand out... See you next year! 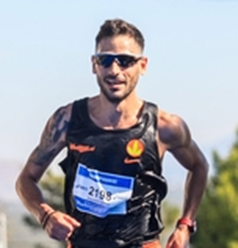 For the race I have no words, it was the most beautiful race I have run, I did not regret for a second the inconvenience I suffered on my trip and the difficult return Heraklion-Athens Athens-Rhodes and Rhodes-Symi... I want to say a big well done to the organizers and volunteers for the incredible hospitality and work they have done and we thank them very much... All the athletes were happy and no one left with a complaint. Everyone enjoyed it. Even the dogs that ran with us enjoyed it and made the beautiful route even more magical. This race made me forget all the races I had run up to today... I count the days for October 1, 2017. Your love will bring me back to hospitable Crete. Thank you very much!!!! A perfect event with all attention to detail. 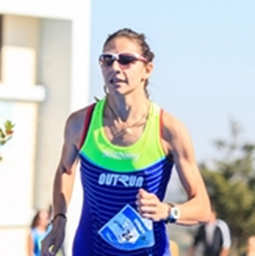 My involvement in such a race has been my craving since I was informed about its organization and I watched all the relevant videos on the internet that with humor and the distinctive Cretan dialect, invited people to visit the beautiful island, enjoying the difficult race and at the same time get to know its beauties. The main slogan of the race "Are you at the start? You are a winner!" was what filled us with confidence and gave us the courage to continue the race, because for us, the amateur runners, what counts is the participation and the moment at the finishing line. I also want to point out the unwavering support of the world, the ordinary people, from the villages on route, as well as the hidden heroes who were the volunteers of the race. Everywhere we went we were welcomed with love and kindness that are characteristics of the Cretan hospitality. The success of each event lies in its organization and how you approach the audience and in this area, the organizers were excellent. We thank you from heart. For me, it was the best and most well-organized street race of my life that was accompanied by a unique masterpiece, a memento, the medal. Until we meet again next year! Well done to all of you! Very good overall organization, excellent in terms of costume equipment and as far as start-up times, always in time without delays, refueling points where needed and volunteers in many points throughout the route. And the photographic coverage was great! Plus, the search one can do for his photos. The experience was unique! I honestly quite enjoyed the 21 km route... well done for the right organization of the race and especially for the hydration on route. I already started lessons of Cretan dances in a Cretan club in Thessaloniki to be ready for dancing next time!!! I wish wholeheartedly that you continue as such, thank you very much for everything and hopefully, I will see you again on October 1, 2017!!! Keep up the good work!! Emotion, tears of joy and pride, but also great effort and struggle for the finishing line. The volunteers and the residents of all five settlements gave everything they had just like us athletes. I am proud of my place of birth, even though I do not live in Crete, I will always support it as much I can, let alone be present at such events. Thanks for everything! I was surprised by the professional organization at all levels, medical presence, spots, advertising of the race! etc. Courtesy and smiles from the volunteers during the races! The participation of the world gave a touch of optimism to all athletes and all those practicing sports! The start and finish ceremony of the race gave a sense of elegance! The music that played in the theater was in harmony with good taste! The bands that were in the city excited the athletes with their music! Many came from Greece as well as from abroad! Impeccable hospitality, awesome organization, enthusiasm and rhythm from the first to the last one who participated in the organization of the race. Everything was perfect. But with your passion, we are surely waiting for more surprises next year. And it certainly comes as a first choice in planning the races for 2017. As soon as we saw the awesome medal, my girlfriend and I decided to book airplane tickets to fly to Crete for the weekend. We had heard about the Crete Half Marathon last year, but this year we organized everything correctly and quickly to go there. And fortunately we did! Wonderful race! The route was superb at the 10km I ran. Demanding, but it went by quickly, like a breeze. The festive atmosphere made you forget the kilometers! Music, people on the street, applause and dances! A big well-done to everyone who worked to make this race a reality. The organizing committee did wonders! They kept our interest even after the race. Distinctions along with traditional dances were a wonderful surprise!